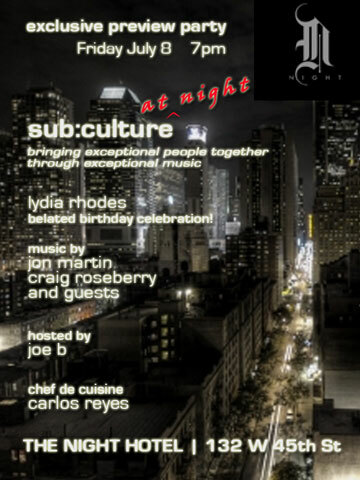 sub:culture – New York City’s preeminent after-work party for the creative and fabulous, returns after a hiatus with a special preview party at our new spot, the NIGHT hotel on 45th Street. Music & nightlife industry veterans Shifty Kid and Jon Martin, along with their ragtag cadre of scenesters, divas, djs and industry whores, offer a funky, rhythmic and diverse experience with NOIRE every Friday at the sultry Night Hotel. Bringing their downtown-meets-underground flavor to the West 45th Street boutique hotel, NOIRE features classic and bizarre film selections from Blaxploitation to Fellini, a delicious menu of light fare and desserts by Chef De Cuisine Carlos Reyes, and a full night of musical delicacies from the hosts and their guests. For the preview party, expect limited CD giveaways courtesy of SONY Music, a sampling of the menu’s highlights and cocktail specials in celebration of legendary singer/songwriter Lydia Rhodes. 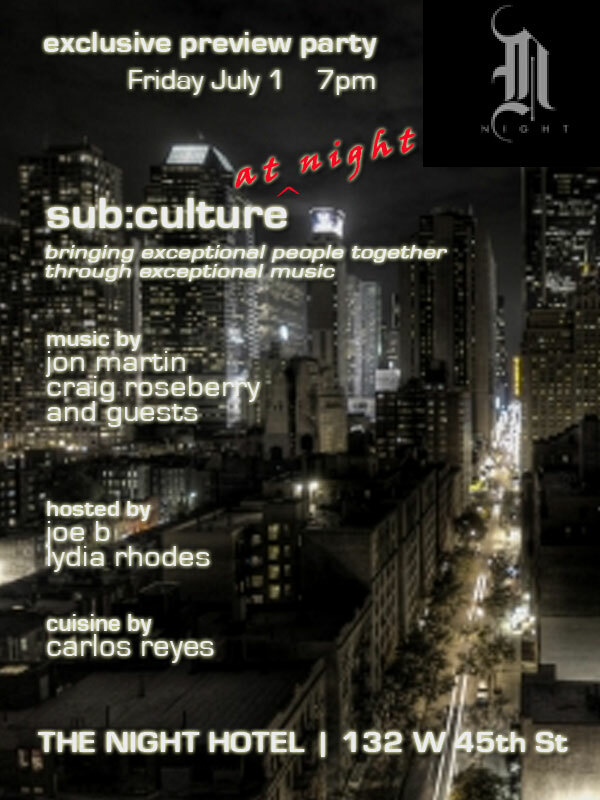 This entry was posted in Uncategorized and tagged after work, club, craig roseberry, house music, jon martin, lounge, music, nyc, parties, sub:culture, time hotel. Bookmark the permalink.